I’m pretty brand agnostic, and I’m not an evangelist for any particular form-factor. 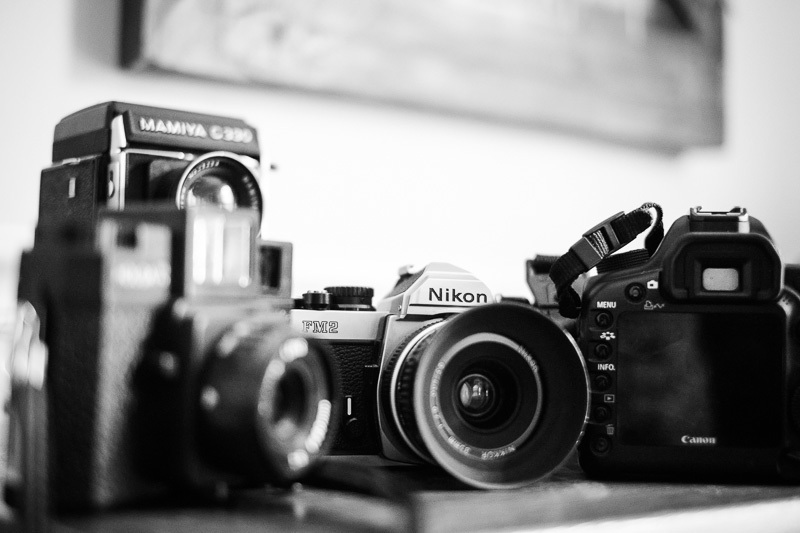 I started shooting Nikon DSLRs, I still shoot a Nikon FM2 and Mamiya 330 occasionally. I shot Canons for paid gigs for the last six+ years, and I am now transitioning to a Fuji x-mount system. I don’t hate this camera! It looks pretty good! I can’t hate a camera that I’ve never used or even heard the official specs for, anyway! Okay. In my mind, Nikon’s marketing department has created a hell of a problem for themselves in the way they have built up to this camera and have been marketing it. If you’ve seen the ridiculous teaser videos, the new Df is supposed to be all about getting back to “pure photography” and slowing down. It was clear from the videos, the leaked specs and images, and the marketing jargon that this was supposed to be a camera that gets back to the core of things. To me, that means a simple, intuitive camera that gets out of your way as much as possible and lets you focus on composition, timing, moment, the fleeting expression, the subtle change of light at the end of the day. It is a camera that has direct controls where you need them, is uncluttered, and doesn’t require fiddling. These are all things I’m coming to grips with with my Fuji X-E1, coming from so much time with Canon DLSRs. 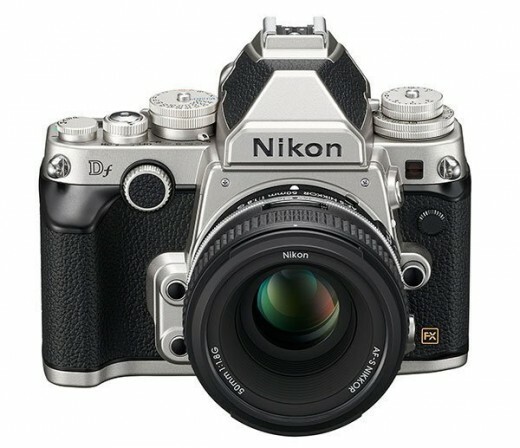 Above is a top-down photo of the Nikon Df… nothing about that top plate suggests anything simple to me. The controls seem logical, well-placed and are no doubt well-engineered. But there are dials-within-dials, dials around buttons, buttons-within-dials, AND an LCD on the top plate. You can make all kinds of arguments about the rationale for this or that, but at the end of the day, that is one of the BUSIEST top plates I have seen on any recent camera. Compare that to the top of a Leica M or similar, and the contrast is striking. On the left of the above photo is a Nikon FM2, and on the right my Canon 5D mark II. The Nikon is smaller, flatter, and the back panel is a lot simpler… as in, there’s NOTHING other than the film window and the viewfinder on the back. Contrast that to the Canon, with its row of buttons, command dial, LCD, joystick, power switch, etc. I’m not complaining about either approach–remember, this isn’t about the actual product at all, really–but I would never call a 5D mark II ‘simple,’ and it’s actually one of the more straightforward and logical designs in DSLRs these days. The thing that really gets me, though, is this whole notion of ‘retro’ in the digital age. We can apply this to DSLRs, mirrorless, whatever. I’m not for or against ‘retro’ or ‘modern’ design–I’ve seen compelling designs styled one way or the other. I am, however, supportive of designs that work with you rather than against you. 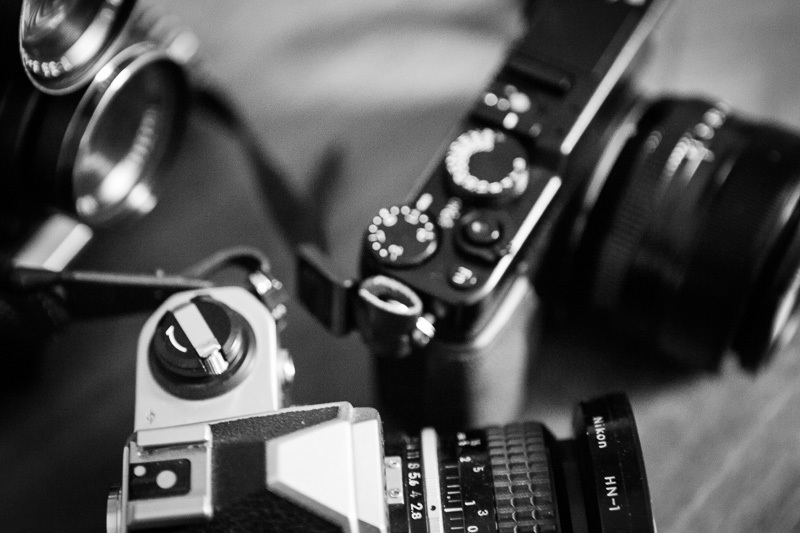 Functional design choices that make sense, and follow the intended purpose of the camera. The new Nikon looks to be a great camera, and I’m sure many will find it an able tool, but there seems to be a lot of dissonance between the marketing ideal and the physical reality. Already this morning I have seen it compared to the venerable Nikon FM, and Nikon itself, as mentioned, has constantly pushed the idea that this new camera gets back to the essence of photography–that is a ‘pure’ experience. 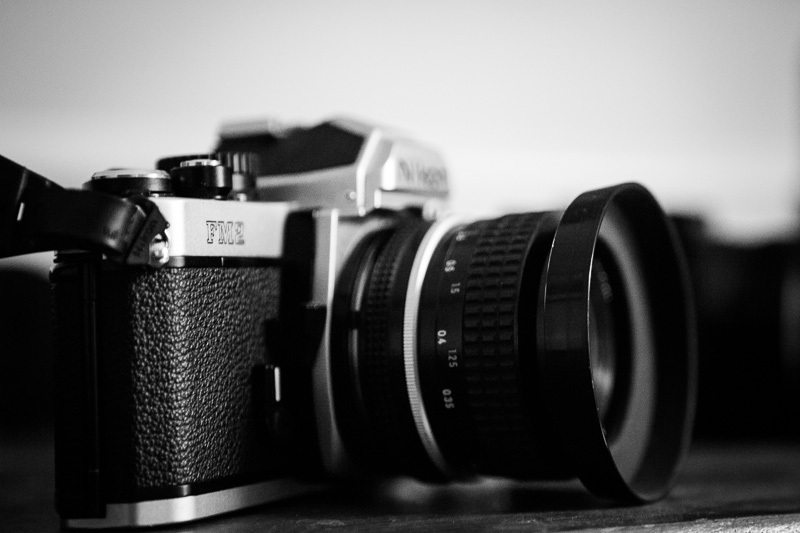 Wrapping a D600 in a retro body, though, doesn’t automatically make a camera somehow more pure. In my mind, what camera makers are really trying to get at when they make a ‘retro’ styled camera is simplicity and focus of purpose. It is a more direct user experience, a more positive connection to the camera. Dials, switches, physical controls. A return to a focused product, without all the latest whiz-bang HDRpanoramalenscorrecteddefringing modes, or video, or a hundred other things that my 5D mark III had that I never used once. For me, that’s what the Fuji X-E1 represents–I don’t care that it doesn’t do video well, I don’t care that it can’t shoot race cars at 6fps (oh, wait, maybe it CAN do that, sort of). It does what I need it to do–allow me to focus onÂ seeing. 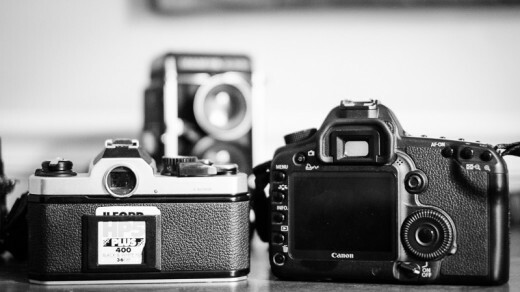 The problems with calling a digital camera retro, and comparing it to something like a Nikon FM, are numerous. Digital cameras, by their very nature, are DIGITAL–i.e., they are fundamentally electronic devices. Even if youÂ could come up with some kind of digital equivalent of a Nikon FM–a camera, remember, that isÂ totally mechanical and can be operated without any battery–it would still need some sort of juice to power the sensor. There is no escaping the need for electricity in a modern camera. You could come up with some sort of crank, or solar power, or whatever, but it would still involve electricity in the pipeline, somewhere. The FM can take a tiny battery to power the meter, but it doesn’tÂ need electricity to operate. This New Nikon certainly does–to power the sensor, to power the autofocus, to power the metering, the rear LCD, the top LCD, the whole imaging pipeline. So stop calling it a digital FM. Really, people. Just stop. And Nikon marketing, stop trying to make this camera into something that it’s not–a simple camera that will somehow transport the user back to a ‘pure’ photographic experience, whatever that means. Your marketing message is already confused, and you’re just going to make it worse. If you want to know what an arguably more ‘pure’ experience is, look at the Leica M, a camera that knows what it is and doesn’t try to please everyone. That’s what this new Nikon is to me, ultimately–a camera that Nikon hopes will please everyone. It’s retro for the hipster crowd, it has twirly dials and twisty-knobs for the ‘purists,’ but it also has autofocus and auto metering and auto modes and continuous autofocus tracking and every other modern thing that camera designers have come up with and stuffed into cameras over the last twenty years. Oh, yes, the Fuji X-E1 has a lot of those things, too. But you don’t seeÂ meÂ calling it retro. That’s a good question–I doubt anyone has any direct comparisons since one is relatively old and the other one isn’t available yet, but I’ll see if I can find things that are dimensionally similar to compare. 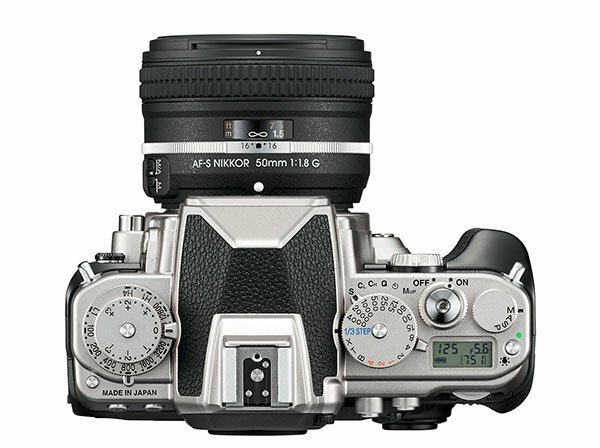 The FM2, though, is much closer to Olympus OM-D EM-5 or Fuji X-E1 size than it is to a Nikon D600, which is what the Df appears to be closest to.